...and Stop Work Stress for Good. 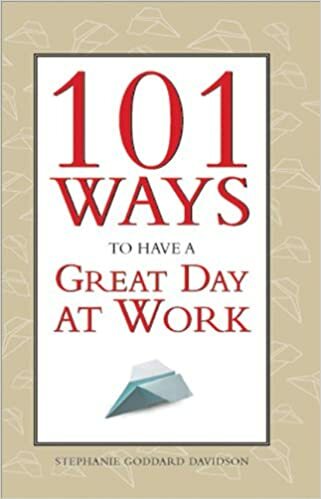 Praise for "101 Ways to Have a Great Day at Work"
"A collection of powerful ideas to turn every workday into a great workday." NEW!! I'm happy to announce my THIRD book is now available on Amazon Kindle and Paperback! You can see excerpts and get a FREE SAMPLE sent to your Kindle. Excerpts are available on the Amazon site including a full table of contents and customer reviews. My first book takes the best information out there for workplace interactions and attitudes and puts them into a format that is quick to read and easy to digest. So many people say they just don't have the time (or desire) to read an entire book---so I took the information, cut the details, and put it into 101 entries. Available in 15 languages. Amazon Business Bestseller and SHRM Bestseller. My second book, "101 Ways to Love Your Job"﻿ is available via the publisher (Sourcebooks Publishing) as well as Amazon. See reviews on Amazon. 'Work Stress Books' to More Work Stress Solutions?